Adult animation is pretty much mainstream fare these days with studios like Disney in the States and Ghibli in Japan turning out block-busters hand over fist. 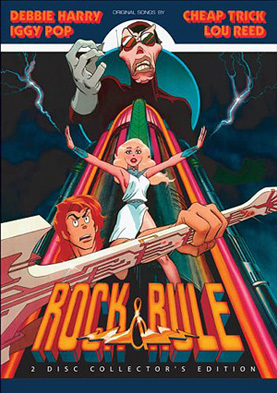 But back in the early ’80s it was quite a novel concept, especially the idea of a feature length rock and roll cartoon. So when a bunch of Canadian animation graduates, under the direction of Clive Smith, set out to make Rock & Rule they found themselves pioneering new ground. Without the benefit of Computer Generated Imagery or other digital effects, the team created hand-drawn cells and mixed them up with, what were then, quite innovative techniques. The film is set in a post apocalyptic world populated by a race of human/canine/rodent mutants. Lording it over this tribe is the evil Mok, a crusty yet dapper rock legend whose singing voice is provided by both Lou Reed and Iggy Pop. Determined to summon up a demon beast, he is on the hunt for “a special voice” to provide the right frequency to do so. That voice, it transpires, belongs to a young hopeful called Angel who sings with the perfect pitch thanks to Blondie’s Debbie Harry. But Angel is happy with her own band (music courtesy of ‘Cheap Trick’) and especially her boyfriend and lead singer Omar. So Mok ensnares her and carries her off to Nuke York in his blimp. It’s here, at Club 666 no less, that the music really kicks in thanks to the contribution of Maurice White of ‘Earth Wind and Fire’. There are interviews with White, Harry, Reed and Pop in a ‘Making of’ documentary and a commentary by Clive Smith who explains just how basic the three-year long production was. If they wanted a hazy look for a scene they simply blew cigarette smoke across the camera and to create the aforementioned beast, they used cow brains which inconveniently simmered under the hot lights. They didn’t even have a Xerox machine which, in retrospect, makes their efforts all the more impressive. Unfortunately for the filmmakers, there was no audience for adult animation at that time of the film’s release. So it now stands as a curiosity; a time capsule of an era when cartoons were made by hand and rock ‘n roll musicals were all the rage.